NTRPDC representatives, including (from left) Cynthia Traore, International Trade Program Manager; Melissa Fleming, Deputy Director; Jody McCarty, Workforce Program Administrator; Nancy Kulick, Administrative Support Specialist; and Ethan Sexton, Community Development Program Manager exhibit winter clothing purchased for Kindness Day. 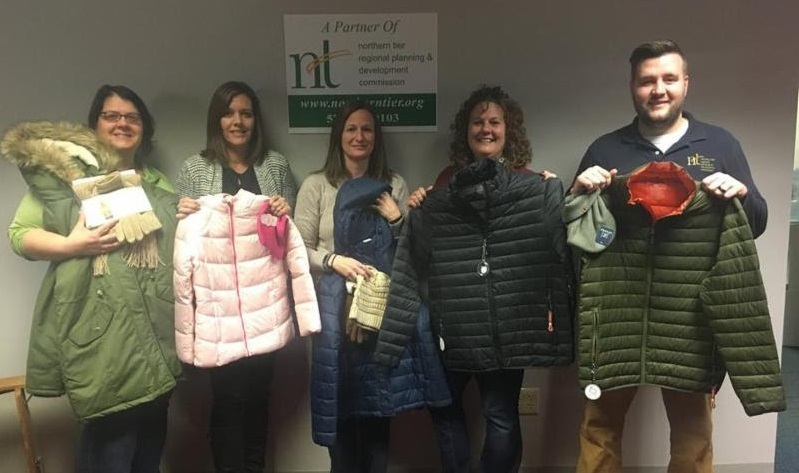 In honor of Kindness Day, Northern Tier Regional Planning & Development Commission (NTRPDC) employees collected money to buy winter coats, boots, mittens and hats for the children of Sullivan County in the Children and Youth Services program. Donations made possible the purchase of 13 sets of winter attire for the children. Northern Tier Regional Planning & Development Commission is a regional community, economic, and workforce development agency serving Bradford, Sullivan, Susquehanna, Tioga, and Wyoming Counties. Our objective is to help businesses expand their markets, generate employment, advance our workforce, improve the local economy and plan for the future development of the Northern Tier Region.